← Known Unknown or Unknown Unknown? The genus Marmara is mostly composed of bark/stem miners, with a few mining in the skins of fruit (notably the “citrus peelminer,” M. gulosa), and two feeding more or less exclusively as leafminers. All published accounts indicate that the bark/stem miners lay eggs directly on the stem, so this business about starting in the leaf and ending up in the stem was a little strange. As far as is known, all of the Marmara species that mine in woody stems have a single generation, with larvae hatching in summer, overwintering partially grown, finishing feeding in spring, and then pupating. Most species exit the stem before spinning a cocoon, and to rear them you need to find the larvae at just the right time, or else luck out and find one that spun its cocoon right on the host plant instead of wandering off to some hidden place where, if you happened to find it, you would have no idea what its host plant was. So in 2014 Julia and I flagged some arrowwood plants that had leaf mines, returning in December to dig them up, pot them, and bag them in transparent fabric with the hope of trapping any adult moths that emerged the following spring. So now all we had to do was return to Nantucket in June and look for the bark flaps, which we did last year. The problem was that the mines of this species are usually so deep in the bark tissue that they aren’t externally visible. Our solution was simply to search every single arrowwood plant we saw, whether or not it had any bark mines that we could see. We spent several hours doing this over the course of a few days, and we succeeded in finding a few dozen bark flaps, some of which were clearly old and empty, but some of which were not. Between June 24 and July 2, three moths emerged! They looked pretty similar to a number of other Marmara species. But in the fall, after my fieldwork had wound down, I reviewed the original descriptions of all 19 described North American species as well as the five South American ones, and I made a table detailing the wing pattern and various life history characteristics for each species. I discovered that all of the species that pupate in bark flaps at the end of stem mines are easily distinguished from this one by the wing pattern. So I was confident that I had a new species. Now my problem was that nowadays to describe a new moth species, you need not only to describe the external features; you also have to dissect it and describe and illustrate the genitalia. This isn’t something I have learned how to do, and even if that weren’t an obstacle, the genitalia have only been described for a few Marmara species, so I wouldn’t be able to properly compare them with those of related moths. Having invested so much effort in learning the identity of this moth, I was determined not to just throw it on the pile of 100+ undescribed Gracillariidae that Don Davis has been working on for 50 years with the intention of publishing their descriptions in a big monograph someday… So I wrote to him and asked if he would be willing to collaborate on a paper describing this moth, in which he would deal with the genitalia and I would do everything else. He said he would be happy to. So I wrote up my little early 20th century style description, and while I was at it I thought it would be fun to put together a table of all the known and suspected Marmara host plants based on published literature along with observations Julia and I had made on various trips around the country. 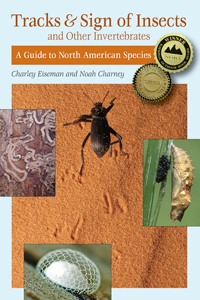 I also incorporated other sources like observations posted to BugGuide.net, and Mike Palmer (in Oklahoma) and Tracy Feldman (in North Carolina) came up with so many interesting new records that I added them as coauthors too. I happened to get the paper back from review while I was in southern California this March, and Dave Wagner happened to be in the room. I started chatting with him about it and realized it was ridiculous to publish this master table of Marmara records without incorporating his data from the past 30+ years, so I added him as a coauthor too, and a few months later he found the time to go through all of his records and add them to the table. The result of our pooled observations together with the literature review is an annotated list of known or suspected Marmara host plants belonging to 115 genera in 50 families. A sizable chunk of these involve the citrus peelminer, which turns up on all sorts of plants in agricultural settings in southern California, but setting these records aside, it is clear that there are more Marmara species without names than there are described ones. One more species has a name as of today though! The paper* was just published, so I can finally unveil the viburnum feeder’s (rather unsurprising) name, Marmara viburnella. Although the three adults from Nantucket are the only known specimens, our observations of leaf and stem mines indicate that this species occurs throughout the eastern US and Canada. Before I sign off, here are some other bugs that are mentioned briefly in the paper but not illustrated. Our collections of M. viburnella cocoons yielded 33 parasitoid wasps in addition to the three moths, belonging to two species. There is no key to North American Quadrastichus species, and as with Marmara, there are probably more undescribed ones than described ones. …and the other 23 emerged from an unknown number of cocoons that were collected together in one vial. They don’t match any of the species recorded from northeastern North America; I suppose a world revision of the genus will be needed before it can be determined whether they belong to any described species. Encyrtids are polyembryonic, meaning that multiple embryos can develop from a single fertilized egg, so it’s likely that all the wasps emerging from one moth cocoon came from a single egg. 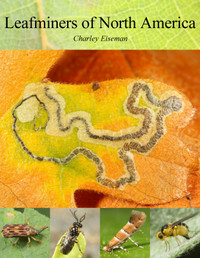 What’s crazier is that, based on what is known about other Ageniaspis species, the wasp egg was probably inserted in the egg or newly hatched larva of the moth back in the summer of 2015, with the wasp larvae biding their time within the moth larva as it mined around in its leaf, down the petiole and into the stem, overwintered, mined some more in the bark until it reached maturity, cut out its little bark flap, and spun its cocoon in the late spring of 2016, then they got around to devouring their host, emerging as adults a few weeks later. Although this weevil can’t be identified to species just from the photo, it is likely N. herculanum, which is known to feed on arrowwood (I assume larvae develop in the seeds). If each of the remaining mystery Marmaras takes me five or six years to sort out, that could keep me occupied for a while… I hope that by publishing a long list of unknowns that need to be investigated, I will inspire at least a few other people to join in the fun. So have at it! * Eiseman, Charles S., Donald R. Davis, Julia A. Blyth, David L. Wagner, Michael W. Palmer, and Tracy S. Feldman. 2017. A new species of Marmara (Lepidoptera: Gracillariidae: Marmarinae), with an annotated list of known hostplants for the genus. Zootaxa 4337(2):198-222. This entry was posted in Solved Mysteries, Uncategorized and tagged Ageniaspis, Anurophorus, arrowwood, beetle, Brentidae, chalcid, cocoon, Coleoptera, Contacyphon, Encyrtidae, Entomobrya, Entomobrya nivalis, Entomobryidae, Eulophidae, Gracillariidae, Hymenoptera, Isotomidae, larva, leaf mine, Lepidoptera, Marmara, Marmara viburnella, moth, Nantucket, Neapion, Neapion herculanum, new species, parasitism, parasitoid, Quadrastichus, Scirtidae, springtail, stem mine, Tetrastichinae, Viburnum, Viburnum dentatum, wasp, weevil. Bookmark the permalink. I’m overwhelmed just reading this, never mind doing the work! The reference to Collembola brought back memories of my Dad and his research. So many dedicated scientists in this world. Thank you for being one. So much to learn, Charley. I’ve been at it for a few years regarding leaf miners, and I’m barely scratching the surface, and that includes rearing and photographing. Congrats on the paper and the persistent research! Thank you. So interesting and it reminds me of how much is going on everyday all around us! The Rabbitbrush, Chrysothamnus is in full bloom here. These plants are full of fascinating creatures. A person could spend decades studying them. A Hopi name for rabbit brush is Sivapi, referring to its yellow color. Congratulations on your beautiful moth and thank you for bugtracks. So assuming the cocoons you gathered are representative, there are 11 wasps produced for every moth caterpillar that survives to adulthood (33 wasps, of two species, to 3 adult moths). I realize that on average, two sexually-reproducing adults of any species will have only two offspring that themselves survive to reproduce, but it seems remarkable to me that moth parents of this species are apparently destined to produce many more adult wasps than adult moths. I guess you see this all the time, though, since so many leaf miners are hosts to parasitoid wasps. Parasitism rates like this aren’t unique to leafminers. I remember Bernd Heinrich remarking, as a group of grad students was opening promethea moth cocoons and discovering how many of them were packed with ichneumon wasp cocoons, that statistically speaking we would be helping the moth population by destroying the moth cocoons at random.